This week, Robert Dover is joining the podcast! Robert is a six-time Olympian, four-time Olympic medalist, five-time U.S. National Grand Prix Champion, and former Technical Advisor and Chef d’Equipe of the U.S. Dressage Team. Robert competed in every Olympic summer games between 1984-2004 — an American dressage record. He won four team bronze medals as well as a team bronze in the 1994 World Equestrian Games. He has also been the top U.S. trainer and instructor of international horses and riders for many years and is an inductee into the U.S. Dressage Federation Hall of Fame. Robert began riding at the age of 13 when his parents gave him a horse for his Bar Mitzvah. At age 19, he focused on dressage and has been involved in the sport for about three decades now — winning more dressage honors than any other U.S. rider. USDF itself says that dressage in the U.S. would not be the same without Robert’s talent, influence, creativity, and generosity. Nowadays, he spends most of his time working with his team and husband, Robert Ross, on their company, Robert-Squared — a 100% luxury vegan leather tack and apparel company. 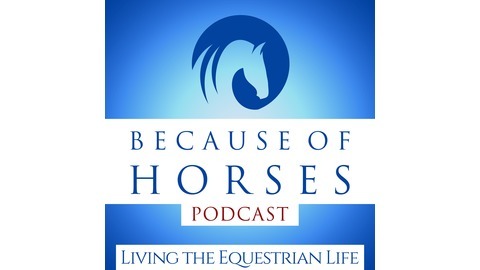 In this episode, Robert speaks all about his experiences in dressage, the new company Robert-Squared, his views on musical freestyle and what he thinks it should ultimately accomplish, some of the characteristics of top riders (and horses) in dressage, how his failures in his career have played a key role in his successes, and the most important aspects riders should consider when it comes to dressage. [:18] About today’s episode with Robert Dover. [1:33] Robert’s thoughts about the evolution of dressage in the U.S. and what he sees for the future of the sport. [3:05] Why the USEF/USDF Emerging Athlete Program (for youth) is so important to the future of dressage. [12:11] Robert provides a sneak peek into the organizational work required to keep dressage viable as a sport. [19:06] Characteristics in the top riders and horses in dressage. And in his own career, how Robert’s failures have played a role in his success. [26:10] How to build mental fortitude. [30:40] How Robert views musical freestyle and what he thinks it ultimately should accomplish. [37:20] Robert’s personal connection with musical freestyle. [43:22] The three things you absolutely need to “own” in dressage. And the major differences between rhythm and tempo. [48:29] Robert’s thoughts on safety equipment and riding. [52:48] Talking Robert-Squared — Robert’s ethically elegant equestrian ware! [55:26] Next week’s episode of Because of Horses. [56:11] More about Robert-Squared: their 100% vegan leather ware, their launch, origin, team, goals, and more! [1:08:33] Where to learn more about Robert Dover and Robert-Squared online. Know Someone Inspirational, Whose Life Has Been Forever Changed Because of Horses? Because of Horses would love to get to share their story! To recommend someone please send an email to elise@becauseofhorses.com. Like what you hear? Because of Horses would love to hear your feedback! 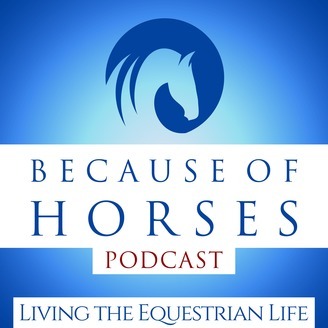 Please email elise@becauseofhorses.com to send Because of Horses your thoughts. ● Donate on Paypal to help keep Because of Horses running — all amounts are welcome!